Factor VII1–3 mainly in the activated form. The product contains approximately equal unitages of Factor VIII inhibitor bypassing activity and Prothrombin Complex Factors. In addition, 1 – 6 units of Factor VIII coagulant antigen (FVIII C:Ag)per mL are present. The preparation contains only traces of factors of the kinin generating system. It contains no heparin. Reconstituted FEIBA VH (AICC) contains 4 mg of trisodium citrate and 8 mg of sodium chloride per mL. FEIBA VH (AICC), Vapor Heated has been prepared from Source Plasma and/or Plasma. The product has been subjected to in-process virus inactivation where vapor is first applied for 10 hours at 601± 0.51C and an excess pressure of 190 ± 20 mbar followed by 1 hour at 801± 0.51C and an excess pressure of 370 ± 30 mbar. (See Clinical Pharmacology and Warnings sections). In a preclinical study to determine the virus inactivating efficacy of vapor heating, samples of bulk FEIBA IMMUNO (AICC) were spiked with 2 x 106/mL infectious units of HIV and subjected to vapor heat treatment. The residual virus titer was found tobe less than 1 infectious unit/0.5 mL. A clinical study4 testing Antihemophilic Factor treated by a similar vapor heating procedure has shown none of 4 lots used in the study to produce non A, non B hepatitis in intensively followed patients naive to blood product administration. The safety and efficacy of FEIBA IMMUNO (AICC) has been demonstrated bytwo prospective clinical trials5–7. The first, conducted by Sixma and collaborators during 1979 and early 1980, was a randomized double-blind study comparing the effect of FEIBA IMMUNO (AICC) and PROTHROMPLEX IMMUNO (a non-activatedprothrombin complex concentrate) in 15 patients with hemophilia A and inhibitors to Factor VIII. A total of 150 bleeding episodes (primarily joint and musculoskeletal plus a few mucocutaneous) were treated. A single dose of 88 Units per kg of body weight was used uniformly for treatments with FEIBA IMMUNO (AICC). The study showed that, based on subjective patient evaluation, FEIBA IMMUNO (AICC) was fully effective in 41.0% and partly effective in 24.6% of episodes (i.e. combined effectiveness of 65.6%), while PROTHROMPLEX IMMUNO was rated fully effective in 25.0% and partly effective in 21.4% of episodes (i.e. combined effectiveness of 46.4%). The second study with FEIBA IMMUNO (AICC) was a multiclinic study conducted by Hilgartner et al. It was designed to evaluate the efficacy of FEIBA IMMUNO (AICC) in the treatment of joint, mucous membrane, musculocutaneous and emergency bleeding episodes such as central nervous system hemorrhages and surgical bleedings. In 49 patients with inhibitor titers of greater than 5 Bethesda Units (from nine co-operating hemophilia centers), 489 single doses were given for the treatment of 165 bleeding episodes. The usual dosage was 50 Units per kg of body weight, repeated at 12-hour intervals (6-hour intervals in mucous membrane bleedings), if necessary. Bleeding was controlled in 153 episodes (93%). In 130 (78%) of the episodes, hemostasis was achieved with one or more infusions within 36 hours. Of these, 36% were controlled with one infusion within 12 hours. An additional 14% of episodes responded after more than 36 hours. Of the 489 single doses, only 18 (3.7%) caused minor transient reactions in recipients. 10 out of 49 patients (20%) showed a rise in their inhibitor titers. In 5 of these patients (10%), the rise was tenfold or more. However, of these 10 patients, 3 had received Factor VIII or Factor IX concentrates within 2 weeks prior to treatment with FEIBA IMMUNO (AICC). These anamnestic rises have not been observed to interfere with the efficacy of FEIBA IMMUNO (AICC). hemophiliacs with acquired inhibitors to Factors VIII, XI, and XII8–12. One case has been reported where FEIBA IMMUNO (AICC) was effective in a patient with von Willebrand’s disease with an inhibitor16. Clinical experience suggests that patients with a Factor VIII inhibitor titer of less than5 B.U. may be successfully treated with Antihemophilic Factor. Patients with titers ranging between 5 and 10 B.U. may either be treated with Antihemophilic Factor or FEIBA VH (AICC). Cases with Factor VIII inhibitor titers greater than 10 B.U. have generally been refractory to treatment with Antihemophilic Factor. Inadequate response to treatment may result from an abnormal platelet count or impaired platelet function13–15 which were present before treatment with FEIBA VH (AICC), Vapor Heated. CONTRAINDICATIONS The use of FEIBA VH (AICC) is contraindicated in patients who are known to have anormal coagulation mechanism. inhibitors to one or more coagulation factors and should not be used for the treatment of bleeding episodes resulting from coagulation factor deficiencies. It should not be given to patients with significant signs of disseminated intravascular coagulation (DIC) or fibrinolysis. Thromboembolic events may occur in the course of treatment with preparations containing the prothrombin complex, particularly following the administration of high doses and/or in patients with thrombotic risk factors. Infusion of FEIBA VH (AICC) should not exceed single dosage of 100 units per kg of body weight and daily doses of 200 units per kg of body weight. Patients receiving more than 100 units per kg of body weight of FEIBA VH (AICC) must be monitored for the development of DIC and/or symptoms of acute coronary ischemia (see Adverse Reactions section). High doses of FEIBA VH (AICC) should be given only as long as absolutely necessary to stop bleeding. It has been reported that FEIBA VH (AICC) and antifibrinolytics have been given simultaneously without complications. It is recommended not to use antifibrinolytics until 12 hours after the administration of FEIBA VH (AICC). Anamnestic responses with rise in Factor VIII inhibitor titer have been observed in 20% of the cases (see Clinical Pharmacology section). Individuals who receive infusions of blood or plasma products may develop signs and/or symptoms of some viral infections, particularly non A, non B hepatitis. If clinical signs of intravascular coagulation occur, which include changes in blood pressure, changes in pulse rate, respiratory distress, chest pain and/or cough, the infusion should be stopped promptly and appropriate diagnostic and therapeutic measures are to be initiated. Laboratory indications of DIC are decreased fibrinogen, decreased platelet count, and/or presence of fibrin-fibrinogen degradation products (FDP). Other indications of DIC include significantly prolonged thrombin time, prothrombin time, or partialthromboplastin time. Some viruses, such as parvovirus B19 or hepatitis A, are particularly difficult to remove or inactivate at this time. Parvovirus B19 most seriously affects pregnant women or immune-compromised individuals. Symptoms of parvovirus B19 infection include fever, drowsiness, chills, and runny nose followed about two weeks later by a rash, and joint pain. Evidence of hepatitis A may include severaldays to weeks of poor appetite, tiredness, and low-grade fever followed by nausea, vomiting, and pain in the belly. Dark urine and a yellowed complexion are also common symptoms. Patients should be encouraged to consult their physician ifsuch symptoms appear. Non-hemophilic patients with acquired inhibitors against Factors VIII, IX or XII may have both a bleeding tendency and an increased risk of thrombosis at the same time. Tests used to control efficacy such as APTT, WBCT, and TEG do not correlate with clinical improvement. For this reason, attempts at normalizing these values by increasing the dose of FEIBA VH (AICC), Vapor Heated may not be successful and are strongly discouraged because of the potential hazard of producing DIC by overdose. Pregnancy Category C Animal reproduction studies have not been conducted with FEIBA VH (AICC). It is also not known whether FEIBA VH (AICC) can cause fetal harm when administered to a pregnant woman or can affect reproductive capacity. FEIBA VH (AICC) should be given to a pregnant woman only if clearly needed. Pediatric Use No data are available regarding the use of FEIBA VH (AICC) in newborns. In the course of treatment with preparations containing the prothrombin complex, thromboembolic events may occur particularly after high doses and/or in patientswith thrombotic risk factors. After application of high doses (single infusion of 100 units per kg of body weight, and daily doses of 200 units per kg of body weight) of FEIBA VH (AICC), laboratory and/or clinical signs of DIC have occasionally been observed. In individual instances myocardial infarction was found to occur after high doses and/or prolonged administration and/or in the presence of risk factors predisposing to myocardial infarction. ranging from mild, short-term urticarial rashes to severe anaphylactoid reactions. Administration of FEIBA VH (AICC), Vapor Heated should be discontinued immediately, if such signs appear. Allergic reactions should be treated with antihistamines and glucocorticoids. Shock should be treated in the usual way. In joint hemorrhage, a dose of 50 units per kg of body weight is recommended at 12-hour intervals, which may be increased to doses of 100 units per kg of body weight at 12-hour intervals. Treatment should be continued until clear signs of clinical improvement appear, such as relief of pain, reduction of swelling or mobilization of the joint. A dose of 50 units per kg of body weight is recommended to be given at 6-hour intervals under careful monitoring (visible bleeding site, repeated measurements of the patient’s hematocrit). If hemorrhage does not stop, the dose may be increased to 100 units per kg of body weight at 6-hour intervals. Two such administrations or 200 units per kg of body weight a day should not be exceeded. For serious soft tissue bleeding such as retroperitoneal bleeding, doses of 100 units per kg of body weight at 12-hour intervals are recommended. A daily dosage of 200 units per kg of body weight should not be exceeded. Severe hemorrhages, such as CNS bleedings have been effectively treated with doses of 100 units per kg of body weight at 12-hour intervals. Sometimes, FEIBA VH (AICC), Vapor Heated may be indicated at 6-hour intervals until clear clinical improvement is achieved. Warm the unopened vial containing Sterile Water for Injection (diluent) to room temperature (not above 371C, 981F). Remove caps from the concentrate and diluent vials to expose central portionsof the rubber stoppers. Cleanse exposed surface of the rubber stoppers with germicidal solution and allow to dry. Open the package of BAXJECT device by peeling away the lid without touchingthe inside (Fig a). Do not remove the device from the package. Turn the package over and insert the plastic spike through diluent stopper (Fig. b). Grip the package at its edge and pull the package off the device (Fig. b). Turn the system over,so that the bottle is on top. Quickly insert the other plastic spike into the FEIBA VH (AICC) stopper (Fig. c). The vacuum will draw the diluent into the FEIBA VH (AICC) vial. Please make sure that the connection of the two vials should be done expeditiously to close the open fluid pathwaycreated by the first insertion of the spike to the diluent vial! Swirl gently until FEIBA VH (AICC) is completely dissolved. Do not refrigerate after reconstitution! After complete reconstitution of FEIBA VH (AICC), its injection or infusion should be commenced as promptly as practicable, but must be completed within three hours following reconstitution. The solution must be given by intravenous injection or intravenous drip infusion. Rate of administration The maximum injection or infusion rate must not exceed 2 units per kg of body weight per minute. In a patient with a body weight of 75 kg, this corresponds to an infusion rate of 2.5 – 7.5 mL per minute depending on the number of units per vial (see label on vial). After reconstituting the concentrate as described under Reconstitution, parenteraldrug products should be inspected for particulate matter and discoloration prior to administration, whenever solution and container permit. Plastic luer lock syringes are recommended for use with this product since protein such asFEIBA VH (AICC) tends to stick to the surface of all-glass syringes. Turn the BAXJECT device handle down towards the FEIBA VH (AICC) concentratevial and remove the cap attached to the syringe connection of the BAXJECT device (Fig. d). 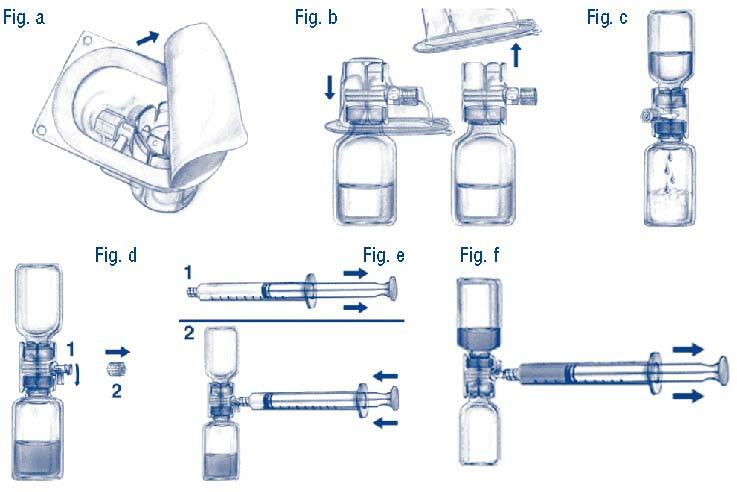 Draw air into the syringe, connect the syringe to the BAXJECT device, inject air into the concentrate vial (Fig e). While keeping the syringe plunger in place, turn the system upside down(concentrate vial now on top). Draw the concentrate into the syringe by pulling the plunger back slowly (Fig. f). Turn the BAXJECT handle to its original position (facing sideway). Disconnect the syringe, attach a suitable needle and inject or infuse intravenouslyas instructed under Rate of Administration. Device, and one Package Insert. Certain components of the packaging material contain Dry Natural Rubber Latex. Store at refrigerated temperature (21to 81C, 351to 461F). Please note: If you transfer the product from the refrigerator to room temperature, it expires at the end of the 6 months period or at the end of shelf life, whatever comes earlier. Record the date on the package prior to shifting the product at room temperature. Avoid freezing, which may damage the diluent vial. Elsinger F.: Aktivierter Faktor VII in Prothrombinkomplex-Konzentraten. 23rd Annual Meeting of „Deutsche Arbeitsgemeinschaft für Blutgerinnungsforschung” (DAB), Heidelberg, 1979. F. K. Schattauer Verlag, Stuttgart-New York, 367, 1980. Seligsohn U., Østerud B., Rapaport S. I.: Coupled Amidolytic Assay for Factor VII: Its Use With a Clotting Assay to Determine the Activity State of Factor VII. Blood 52: 978, 1978. Seligsohn U., Kasper C. K., Østerud B., Rapaport S. I.: Activated Factor VII: Presence in Factor IX Concentrates and Persistence in the Circulation After Infusion. Blood 53: 828, 1979. Sjamsoedin L. J. M., Heijnen L., Mauser-Bunschoten E. P., van Geijlswijk J. L., van Houwelingen H., van Asten P., Sixma J. J.: The Effect of Activated Prothrombin-Complex Concentrate (FEIBA) on Joint and Muscle Bleeding in Patients with Hemophilia A and Antibodies to Factor VIII. The New Engl. J. of Med. 305: 717, 1981. Roberts H. R.: Hemophiliacs with Inhibitors: Therapeutic Options. The New Engl. J. of Med. 305:757, 1981. Hilgartner M. W., Knatterud G. AND THE FEIBA STUDY GROUP: The Use of Factor-Eight-Inhibitor-ByPassing-Activity (FEIBA IMMUNO) Product for Treatment of Bleeding Episodes in Hemophiliacs with Inhibitors. Blood 61: 36, 1983. Thomas T., William. H., Williams Y., Hunt J.: FEIBA in Haemophiliacs with Factor VIII Inhibitor. Brit. Med. J.
Rolovic Z., Elezovic I., Oobrrenovic B.: Life-Threatening Bleeding Due to an Acquired Inhibitor to Factor XII– XI Successfully Treated with FEIBA. Proceedings of Joint Meeting of the 18th Congress of the International Society of Hematology and 16th Congress of the International Society of Blood Transfusion, Montreal. Abstract 703, 1980. Preston F. E.: A Review of Cases Treated with FEIBA in 1977/78. Presentation at the Second Workshop on Factor VIII Inhibitor Patients, Vienna, 1979. Vermylen J., Sschetz J., Semeraro N., Mertens F., Verstraete M.: Evidence that ‘Activated’ Prothrombin Concentrates Enhance Platelet Coagulant Activity. Brit. J. Haematol. 38: 235, 1978. Semeraro N., Vermylen J.: Evidence that Washed Human Platelets Possess Factor-X Activator Activity. Brit. J. Haematol. 36: 107, 1977. Wensley R. T.: General Summary of the Use of FEIBA in Haemophiliacs with Inhibitors to FVIII. Presentation at the Second Workshop on Factor VIII Inhibitor Patients, Vienna, 1979. Hilgartner M. W.: Personal communication.